The proposed redevelopment of Silverdale and Dairy Flat as one of Auckland’s future industrial hubs has been earmarked in a new plan by the Auckland Council. And the public is being asked for their feedback on the proposal. The Auckland Council says with thousands more homes planned for the city’s northern areas over the next 10-20 years it also has to plan for job growth to match the needs of new communities. 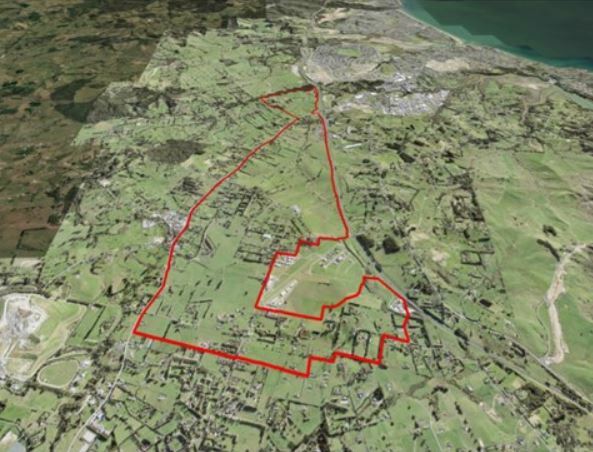 “The Wainui Silverdale Dairy Flat area will become one of Auckland’s key growth areas in the next 30 years, and that growth will require significant new provision of business land and other retail and services space to accommodate employment and meet the future needs of the community. The report says it’s the most suitable area for light industrial development in the northern part of the city that’s still relatively close to urban Auckland. Hibiscus and Bay Local Board chairwoman Julia Parfitt says the proposed redevelopment is needed to address Auckland’s growth over the next 30 years. “We must strive to provide employment close to where people live” Parfitt says. “Long commutes place a huge, unproductive strain on both people's quality of life and our transport infrastructure." And she says giving people who live in the area the option of working nearby is crucial to that. But Auckland councillor Wayne Walker says while he understands the potential for growth in the area, it’s important that the council gets the planning right. Walker says the area proposed will feed into the nearby Okura and Weiti Rivers. He says the Okura River links up with the Long Bay-Okura Marine Reserve which has already been the subject of legal battles over the affect development has had on the area. He says while the development is designed to allow people who live in the area greater employment opportunities, it will still generate traffic and commuters from other areas. The plan is open for public consultation until 28 April and also looks at the environmental impact, essential transport needs, including public transport, cycleways and walkways and motorway connections. Auckland is building a suburb 15 km from the edge of the city and an industrial park near to that suburb. Auckland does this knowing people will commute across those additional 15 km in both directions. Long commutes place a huge, unproductive strain on both people's quality of life and our transport infrastructure. Have you taken it upon yourself to just blindly yell "sprawl, sprawl, sprawl" at any Auckland Council policy? Only when the Council sprawls development pointlessly long distances away from our population centre and enforces extra long commutes. Most people neither live in the centre, nor work in the centre. That has been a core problem with planning, having it all Queen Street focused. Decentralised options are important. I know and it is common in cities to have decentralised growth options. There are some good practices concerning decentralised growth. In a normal city decentralised growth is done by adding to the existing transportation/infrastructure network. Growth by utilising latency of existing infrastructure. For instance in Auckland we have a rail network extending from Waitakere to the CBD to Pukekohe; a bus network encompassing Albany, Waitakere, Howick, Papakura and all points in between; cycle-lanes that mirror the bus network coverage. In Auckland places adjacent to, or in possession of, good latent infrastructure capacity have had development banned - Greenhithe, Ardmore, Drury-Paerata. Instead of utilising existing infrastructure Auckland delights in positioning new developments further away - Silverdale, Huapai, Riverhead, Beachlands and Pukekohe. This is why I say Auckland has a sprawl problem, because the growth sprawls beyond the infrastructure. Weird that you think we should be centralising industrial development around the existing historical population centers and not in the urban growth areas. I guess, if you have your own unique definition of sprawl and ignore the polycentric approach, it might be possible to think that. Polycentric development is a quite common compact growth mode, becoming most viable in high population cities. Polycentric growth does not normally incorporate big gaps. The llama and pony paddock type lifestyle blocks that Auckland places between nodal centres, creating gaps that disrupt effective public transport, these are not found in polycentric growth. Normal polycentric centres get linked by good public transportation options, which are sustained by reasonable population density across the network. Polycentric areas don't normally incorporate gaps? Are you familiar with the Ruhr area? There is no reason why polycentric regions cannot have gaps. The big thing is the closing of the economic distance - i.e. gaps aren't an issue with good transport infrastructure. Auckland isn't blessed with such infrastructure. But ignoring growth plans and saying that we need to centralise because of the lack of existing capacity is insular and contrarian. Try to keep up, I am saying we should build where we have existing capacity. Auckland is blessed with some good transportation infrastructure. We have paid for (at $multi-billion cost) motorway, rail, bus & cycle linkage allowing for 1.4million people to access Takanini-Ardmore. In pursuit of their sprawl addiction Auckland Council block development there, because they wish to spend megabucks replicating this good existing linkage at much more remote locations. I am a little familiar with the Ruhr. It was not planned. Rather a mess of ancient feudal towns, with petty insular rivalries grew up next each other into haphazard mess as industrialisation took hold. It is an accident of history created by ignorant inbred German nobility and remote religious governance. I would agree with you in thinking its level of applied planning expertise as being very similar to Auckland Council. Since when is Ardmore close to the motorway? Is Silverdale no longer split by the Northern Motorway? Are Kumeu, Pukekohe, Huapai not on the existing railway line? Interesting that you despise development in each of these areas, despite them being close to existing infrastructure, but advocate the build up of the isolated flood plain that is Ardmore. The point wasn't how the Rurh area came to be. It was your contention that polycentric urban areas don't allow for gaps in contiguity between the hubs, which is nonsense. The main thing that polycentric regions have going for them is the small economic network distance (this is what made the region so prosperous). Auckland has terrible transport infrastructure, by any standard and by centralizing industry further, forcing more fringe development to occur (sprawl), like most of your blind man yelling at a wall solutions, is not an efficient approach. Ardmore-Takanini is 0 km away from the existing city. This 0 km distance is a smaller distance than the distance to Huapai, Paerata, Silverdale or Beachlands. But you think Ardmore is the most isolated of these 5 locations. I cannot work out the reasoning there, it seems odd. But in terms of oddity it is consistent to your "centralising" causes more "sprawl" argument. I believe that extent of sprawl is defined by how sprawled apart growth is allocated, you think sprawl is defined by how centralised new growth is. We differ in our reasoning. I contend that by forcing exurban development to occur in the more remote fringe locations we increase sprawl and cause greater pollution. Silverdale has a motorway with 50% of the carrying capacity of the connection to Takanini, a bus service with awful connectivity, no rail and virtually non-existent cycle connection. And it is 15 km distance from any reasonable population base. Therefore it is the ideal candidate for development by a council that wishes to create massive sprawl and cause huge traffic jams. I never said Ardmore was the most isolated. I said it was isolated by the fact that it has effectively the same infrastructure as the other mentioned developments. It is not 0km from the existing city, and to connect it to the network would require a huge roading investment. Especially if your argument is that people don't live close to where they work. Well, you need to redefine what sprawl is. Sprawl (the technical definition) refers to urban growth as a result of absent urban planning. You conflate the definition with your own arbitrary boundary allocations and ideas about what 'sprawl' should imply. I'm saying centralising industry leads to more fringe sprawl or fringe development because it has to - More industry demands more workers. More workers demand more houses. Houses are only developed en masse on the fringe. The result - larger economic distance. The idea with the satellites - Puke, Kumeu, Silverdale is that we can better structure this. Stimulating urban growth in these areas is not sprawl for greater Auckland. It is intended to reduce the economic distance in the growth areas - i.e. workers have both greater choices for where to work and where to live. 15km away from any reasonable population base? The Hibiscus coast has around 50k residents and is one of the key growth regions in New Zealand. You'd prefer that these people traveled to new industrial/commercial centers in Takanini, instead of Silverdale? So much for your abhorence on the basis of traffic and pollution. Also polycentric litellay means multiple centres of comparable order of magnitute, like the Ruhr. The centres are of similar size and people can find jobs of similar value. Thus the amount of requirement for commuting is decreased. The muppets at Auckland Council are BSing to think that a city with 1,450,000 people and some peripheral towns with 50,000 people is somehow polycentric. The huge scalar difference means that jobs in Auckland City are much more valued and people are forced to commute long distances. But you must have worked that out already. Heh. "We must strive to provide employment close to where people live” Parfitt says. “Long commutes place a huge, unproductive strain on both people's quality of life and our transport infrastructure." Well, the Plannerz insist on separating all sorts of uses by zonerating to the nth degree. No longer can the shopkeeper live in the flat above the store, the temporary construction crew live in a donga at the latest site, the mechanic trade from a three-bay garage at home, or the budding fashion designer sew and trade from the spare bedroom. Well, at least not legally. In practice, good neighbours, high fences and quiet work habits mean that all this and more activity is happening anyway: people simply can't be arsed dealing with the Clueless Councils and their minionz. Planning which enforces separation of uses causes Commuting. It's as sad and as simple as that. The RMA was designed to handle incompatible uses by examination of Effects. This doesn't need spatial Zoning to be present, but the Town and Country Planning Actorz simply could not conceive of a future without squiggles on maps. Most councils seem to operate on a moan minimisation basis. People moan loudly about living next to things they don't like. And they moan the loudest when they know that if the thing gets moved this will improve their property values. There are plenty of bad neighbours. However if we let people build and live wherever we end up with a sprawled out mess and then people moan about the traffic, which is the consequence of living in a sprawled out mess. The public transport networks that could work for a focused commute cannot find a focus. Has anyone used the Silverdale interchange of late? It is already a nightmare. Drove along Dairy Flat highway today. First time ever. I'd hope there'd be somewhere with less appeal that this could be done. That or, you know, we could stop importing a net 40k to 60k people a year! And perhaps then we wouldn't have to keep doing this?